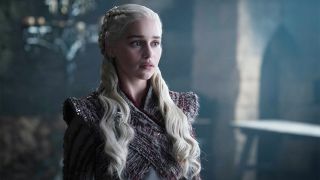 With Game of Thrones season 8 just days away, the Game of Thrones ending is in sight, but as emotional as it’ll be for us, the fans, to say goodbye to the show, imagine what it must be like for the cast? It’s been 10 years of their lives (if they were in the show from the very beginning), so understandably, they have mixed emotions about saying goodbye to the world of Westeros. When I sat down with the cast earlier this year to quiz them about the final season, I couldn’t help but ask them about their last day of filming. For some, their final day was incredibly emotional (“I was a mess,” says Gwendoline Christie, who plays Brienne of Tarth), while for others, it was actually quite tedious (“Pickups of a scene I’d done four times already,” Conleth Hill, AKA Varys, tells me), and then there’s those who were inconsolable: “That was the day I realised that alcohol can also be a depressant,” reveals Emilia Clarke, who plays Iron Throne frontrunner Daenerys Targaryen. “My final day was actually the final day of shooting for most of the crew, besides a little splinter unit that were going to be doing little pickups. So it was quite an emotional day for everyone. The scene that we shot, Arya was alone, and it was so serene, and a really slow careful scene, which isn’t what I get very often. It’s usually hacking and hammering. “It was really sensitive, and that was lovely, to be able to do that on my final day, because I felt quite fragile that day anyway. But yeah, they called ‘cut’ and… I don’t know... I’d watched everyone wrap. I’d been there for everyone else’s wrap, and had shed tears. I think, for me, I knew at that moment that I wasn’t ready to say [goodbye]. I wasn’t ready to feel that emotional at once. It definitely happened for the weeks trickling after, when I was, say, on my sofa and had unpacked my case for the final time. “I didn’t wrap in Belfast. I wrapped somewhere else. Quite a few other people wrapped that day. So that was a shared experience as well. But I remember just feeling emotionally exhausted. This is going back to the hotel with people; we knew we were going to a party, but it just didn’t feel like there was anything to celebrate. I didn’t feel in a celebratory mood. “It was quite emotional. I had my baby with me. So I just went and fed my baby. Changed her nappy, fed the baby. But it was very emotional to finish, to wrap your last scene. It’s a very emotional moment. They gave everybody, I believe, as they wrapped their character, at whatever stage of the season – we were all given a little gift by the showrunners, and they made a little speech – particularly for us. “We were given a gift and a round of applause. So it was really beautifully marked. We were really given a very final, beautiful moment that sort of signified that this is where the journey ends. Everybody felt that they were appreciated, and were sent off correctly. “I was in floods of tears on my last filming day. I tried to reciprocate that to Dan and David. There’s all these really beautiful gifts – sort of storyboard things, from significant scenes that we’d been in. And then I finished that. ‘Bye.’ You just want to get away. “I had a great last scene. It was absolutely beautiful. It was the perfect way to end. Obviously I can’t tell you what the scene was, but it was just perfect. It wasn’t the final scene, but you know, it was close to the end. We shot it in a beautiful location. At the end, at this point, I’d already seen quite a lot of colleagues wrap. So I’d seen a lot of tears, a lot of beautiful speeches. “It was super-emotional. That was the day I realised that alcohol can also be a depressant [laughs]. No, it was magical. “But I would never normally do a little thing on wrap of any movie. I would never stand up and say anything. But for this, the boys gave us all a gift. Everyone got a goodbye. Every character got an official proper goodbye, with lots of people. Game of Thrones season 8 premieres on April 14 on HBO in the US and a day later on Sky Atlantic in the UK. Get ready for the final season with our ultimate Game of Thrones recap or watch the video before to get caught up in 16 minutes.